Coyne Cup fever is ramping up as we count down to the showdown between Team Coyne and Team Paddy in Mayo, Ireland this September. In preparation for the drafting of our two sides, Captain Paddy sent out a questionnaire to our 44 participants in the hopes of getting to know the talent pool a little better. While you might not be on this trip (it sold out, but don’t miss out on next year–an announcement for Coyne Cup 2017 will follow soon), these questions might help you get to know yourself a little better. Or get to know Paddy the Caddy better. Or just make you wonder what the hell we are going to be up to in a month’s time. Take some time and get to know your golfing self. Self-inventory is good for the soul. 1. What is the best major in Golf? 2. Pro V1 or Noodle Pink 4?? 5. Metal Spikes or Soft Cleats? 6. How old is the oldest pair of golf shoes in your closet? 8. What is the Stymie Rule and are you willing to use this to beat Coyne’s Team if selected to Paddy the Caddy’s Team? 9. Captain Kirk or Mr.Spock? 15. How many sets of golf clubs do you own? 21. U Groove or V Groove, which one is illegal? 22. Should cheerleaders be added to next year’s PGA tour? 25. Mrs. Dustin Johnson or Dustin Johnson? 26. What is your favorite Tom Coyne book? A Gentleman’s Game : a fictional story about growing up at Rolling Green Golf Club. Paper Tiger : a true story about how Tom scammed his publisher into one year of golf and a trip to Asia so he could ask his girlfriend to marry him. 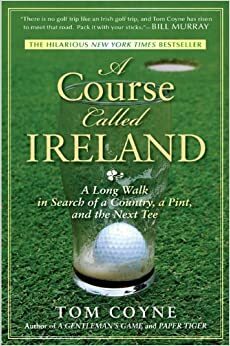 A Course Called Ireland: a true story really about Paddy the Caddy and his family living in Ireland and Tom scamming his publisher one more time (summer in Ireland sounds good). PADDY THE CADDY OR Robert Thomas Coyne? Good day and make good decisions.